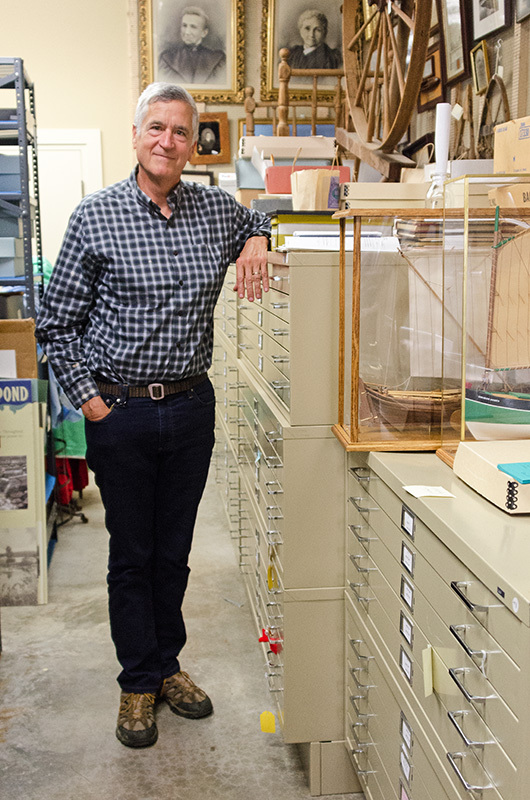 Tim in the archives of the Mount Desert Historical Society. On October 5, 2017 I joined Tim Garrity, executive director of the Mount Desert Historical Society at the society’s headquarters in the old Sound School House. You may remember Tim from Coast Walk 13, when we found the remnants of the old Village Improvement Society trail near Hunters Beach. We’ve had some interesting discussions about how historical narratives change over time, and I asked him if he’d talk about two local stories that hover between history and legend. Tim: What you would like to [talk about] today? Jenn: You had mentioned either Norwood Cove or Fernald Point. Tim: Yeah. Fernald Point … is often cited as the site of the Jesuit mission of Saint Sauveur in 1613. But it has never been proven. Proof would entail the finding of archeological specimens … that would indicate the presence of a French mission there. But they may not exist. They may have been pretty scarce in the first place because the mission only lasted a few weeks and might not have left much evidence behind. … The French had made a choice. Rather than build fortifications, they would make a garden to feed themselves. And without fortifications, they, a) left no archeological evidence and, b) were easily defeated by the English force … from the Jamestown Colony in Virginia. From 1613 until about 1858, a period of about 250 years, the location of the Saint Sauveur mission, the exact place, had been forgotten. What happened in 1858 is that the … Canadian government, published the Jesuit Relations. They are the letters and memoirs of the Jesuit missionaries over a period of over 100 years, including the letters of Father Pierre Biard, who was the lead French Jesuit missionary on the expedition. He wrote back to his Jesuit superiors in Paris to defend the fall of the mission and to explain his efforts at missionizing the Indians, and learning their language, and talking about their ways of life, and described in detail the site of the Saint Sauveur mission and its fall. These had been … hidden away in archives in Paris … in manuscript form for a century and a half, and became popularly available in the French language with the publication of the Relations in 1858. One of the readers of this new publication was Elijah Hamlin of Bangor, an attorney, the brother of Abraham Lincoln’s vice president, Hannibal Hamlin. He read the accounts that described the location of the Saint Sauveur mission and interpreted that location as Fernald Point. Hamlin’s interpretation was picked up by Francis Parkman, who was then America’s most eminent historian. And Parkman published the location in 1865 in his book France and England in the New World. That was a runaway history best-seller. And it popularized Fernald Point as the location. This in turn was picked up by others because Parkman was so wildly popular as a historian. And with the first suggestion that Fernald Point was the location of the mission, we start to see “evidence.” Purported evidence is found there at the site. “St. Sauveur mission, Mount Desert,” ca. 1866, by Eugene Vetromile. Image courtesy of Maine Historical Society. One is a map drawn by another Jesuit priest Father Eugene Vetromile, an Italian who was also missionizing Indians in the Bangor area. He came there in 1860, and he drew a map that showed the remains of the fortification, showed the grave of Brother Gilbert du Thet, who died in the attack. 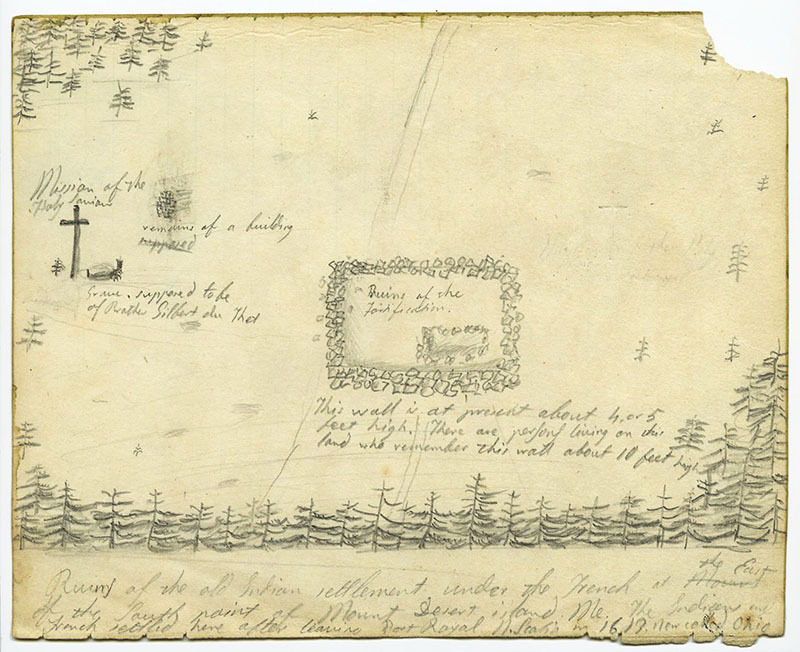 Tim: No, Vetromile comes by 250 years later, after the site is “shown” to be the site of the Saint Sauveur mission and he draws a picture and a map of what he calls the remains of the fortification and the grave of one of the Frenchmen who died. It turns out we have a photograph of this area from atop Flying Mountain that looks down on Fernald Point, and it shows that what Vetromile thought was the remains of the fortification was actually the foundation of a barn that was standing on the site. View from Flying Mountain over Fernald Point. 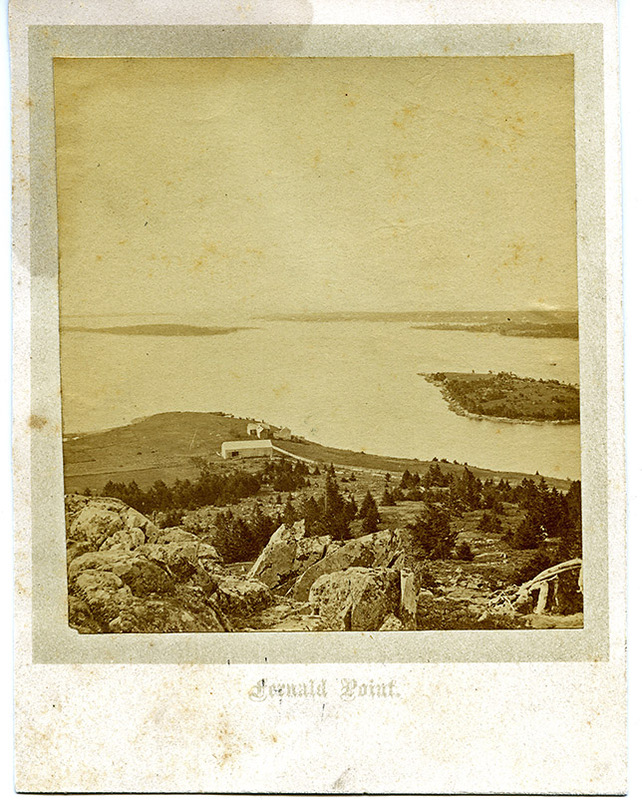 Photo courtesy of the Sawtelle Collection, Acadia National Park. We know from the history itself that the French built no fortifications, and that if there was a memorial to Brother Gilbert du Thet, as Vetromile drew it in the shape of a stone cross, somebody had put it there [later] to represent the grave. The Norwood Cove Object, Southwest Harbor Public Library. 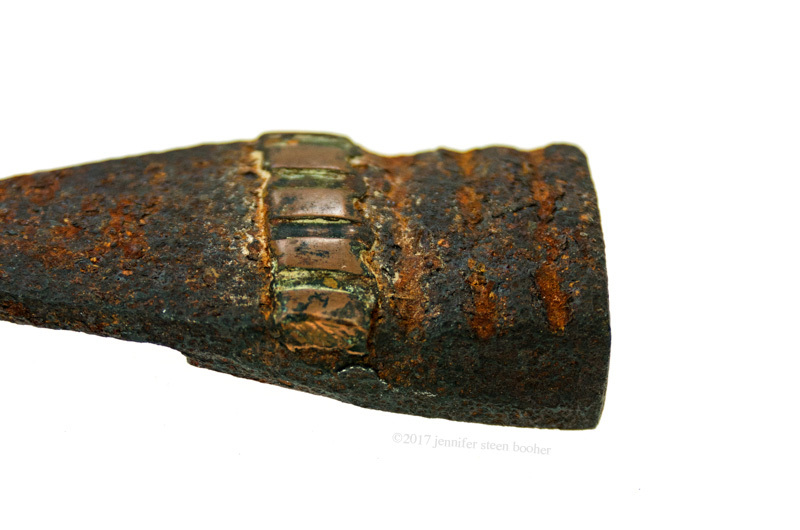 Detail of the Norwood Cove Object showing shell casing band, Southwest Harbor Public Library. We [also] have the Norwood Cove object that was said to have been found in 1921 and presented to the Southwest Harbor Public Library, where many people interpreted it as a dagger that was a remnant of the mission. It turns out that actually that’s a piece of trench art from World War One [Ed. note: made from an empty shell casing] presented by somebody who had been there. An American serviceman who lived in Southwest Harbor knew the story. Also, this tradition was picked up by the founders of [Acadia National] Park, who were eager for the new park to have French associations because in their pitch to Congress to make this place a park, they cited its unique geographic location …, its healthful … wild lands on the edge of the Eastern megalopolis …, and the third and final thing they cited was its historical significance, to which they pointed to Fernald Point as evidence of the French mission and exploration. Much of what we think about Fernald Point may or may not be true. There are historians who are willing to argue the point. The problem is that in his letter, Biard said that the mission was, in the French, ‘separé’ – ‘apart from’ – the island of Mount Desert. Parkman cited this, and he said that Biard must’ve been mistaken. In other words, Biard didn’t know where he was. But that’s really unlikely because even though it was a new place, Biard had been there in 1611 with Champlain. He knew perfectly well how the island was put together. It’d been mapped, identified, so there was no mystery as to where he was. Other more recent scholars, often Canadian, because they don’t have a stake in Acadia National Park being associated with the French, say it was more likely in a place like Lamoine. It answers the description better. And also it turns out that plenty of places on the coast of Maine answer to a very similar description of Fernald Point – facing the southeast, a field rising up to mountains. It matches a lot of descriptions. There have been many archeological studies of Fernald Point. Most of them have been directed at the Indian middens or shell piles that are on the shore. But no one has ever turned up a true artifact of the mission. There is a tantalizing little possibility, and that is a report of the Bangor Historical Society in 1911 that reports on items lost in a fire at the Bangor Historical Society, one of which was a weapon of French design found at the site of the Saint Sauveur mission. So if you want to hang on to that, there’s still that out there. Jenn: I actually find the – how should I put it – the history of people’s desire for that to be the location [just] as fascinating as finding the original location would actually be, maybe more so. Tim: And I just heard this week at a lecture at UMaine that after Bram Stoker published his book “Dracula,” there were vampire sightings all over Europe. Tim: And subsequent to the publication of that poem, there was … a rise of Viking sightings – of runes, inscriptions on stones, and remnants of Viking ships. Even, in the 1930s, the finding of a Norse coin near Naskeag Point in Brooklyn on the Blue Hill Peninsula, which modern scholarship calls into question as very possibly it had been planted there by the archeologist who claimed to find it. The best interpretation is possibly it arrived there – it’s [something] like a 15th century Viking coin – it very possibly arrived there through trade, not necessarily as a Viking site. So, yeah, I think there’s a real pattern of suggestion giving rise to observations that are just not really set in reality. Jenn: People really want to believe. Jenn: Is [Lawler] the one who gave the artifact to the Southwest Harbor? Tim: Yeah, he’s the one. … And Ralph says that he was a practical joker. He tells many stories of what a sense of humor this guy had and how big and boisterous he was and that this really is in keeping with the kind of thing he would have fun doing. Jenn: Now we just need to find a note in which he wrote it down. Tim: Yeah, if only … Though I got a call from, [someone who] talked with the son of Christopher Lawler, who is 92 and lives at the retirement home in Orono, who says that he remembers his father finding this thing. But … I don’t think the dates work out. … If he is 92 and this thing was found in 1926 or 1921, he’s just not old enough to remember it. Tim: … about the battle of Norwood Cove and the casualties and the Tenedos, the British ship. It is said that they took multiple casualties there, the British, like five dead. I just attended a lecture at the University of Maine that points to the Gale resources, [about] 26 million documents from the 17th and 18th century of Britain, all the newspapers. I would like to look up the British side of that story because it smacks of legend. Have you heard of much of this story? Capture of the USS President by HMS Tenedos and HMS Pomone, 1815. Painting by Thomas Whitcombe [Image found in a chat room, couldn’t find a more reliable source. http://www.kenthistoryforum.co.uk/index.php?topic=15588.0] I think the Tenedos is the second largest ship. Jenn: I’ve heard that, was it Captain Spurling from Cranberry Island? had left a boat in Norwood Cove, and the British were coming to destroy it, and there was kind of a Paul-Revere’s-ride of people going from Southwest Harbor to gather defenders. Tim: I think that’s part of it. Let me … I think I can get to it. Jenn: The British were requisitioning or destroying all the fishing boats is how I heard the story. Tim: Yeah. And I think the most complete account was by George Street in Mount Desert; a History. So let’s look up Tenedos. … Yeah. You may have this story as well as I do. So I was in London, and I noticed that there is an inscription on a tablet on one of the chapels [at] Westminster Abbey. To the left there’s a little chapel that isn’t so crowded, and it’s filled with these tablets, and people buried in the floor and so forth. One of them describes a fight like this. It was in Maryland, and it takes note of the English wounded and the young officer that was killed [who was] slain and buried in this chapel. It was a big deal to lose seven men in a fight of this kind. And I would love to check the British side of this story. What was the journey of the Tenedos? Jenn: There must be records of that. Jenn: Why? What’s it mean? Jenn: I just wonder why it’s a popular name. It seems odd. Tim: Yeah. There’s a British museum, too, in Greenwich, a naval museum. It would be great to really dig in and find out. Jenn: Yeah, that would be really cool. Tim: Because this sounds … This is a one-sided account. What was the account on the other side, and what was going on? What was the larger context? It really deserves a more thorough understanding than the one I have. 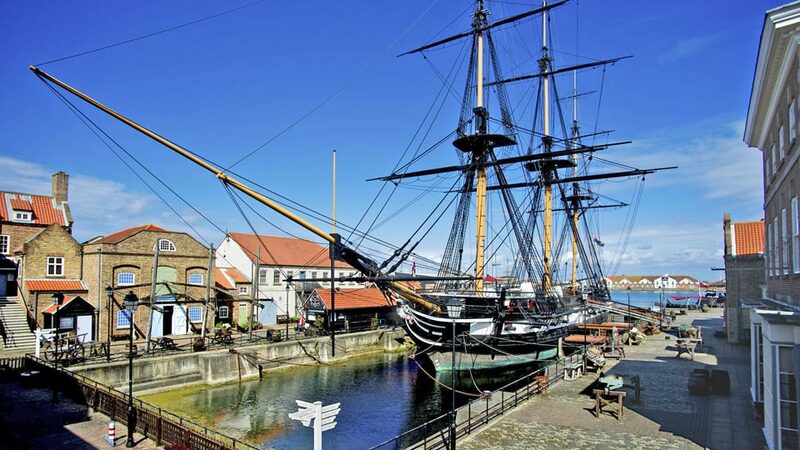 The HMS Trincomalee – according to one source, Tenedos was an identical Leda class frigate. Tim: Yeah. That’s the wonderful thing about this job is it’s so easy to get distracted. 1. It turns out that Tenedos is a Turkish island near the entrance to the Dardanelles. It’s mentioned in the Iliad as the base of the Greek fleet during the Trojan War, and also shows up in the Odyssey and the Aeneid, so perhaps the 18th century British ‘classical education’ accounts for its popularity. 2. According to Wikipedia, the name comes from the Greek hero, Tenes, who ruled the island during the Trojan War. 3. 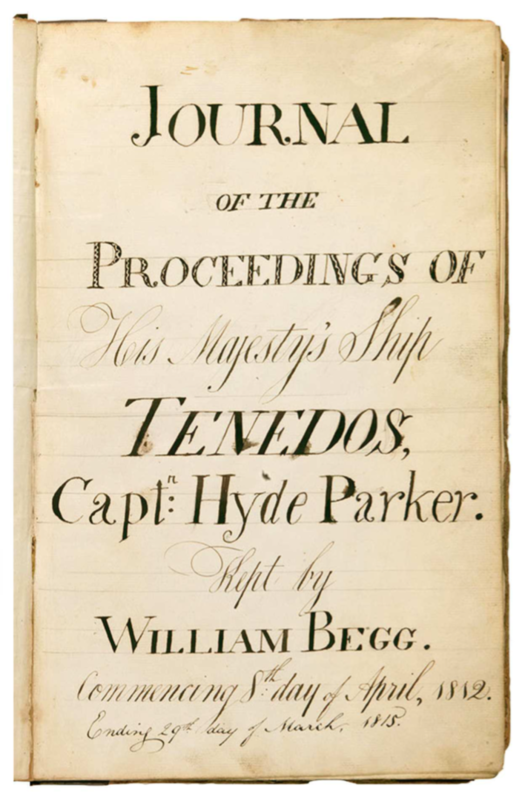 Also from Wikipedia: “HMS Tenedos was a 38-gun fifth rate launched in 1812. She was used as a convict hulk from 1843 and was broken up in 1875.” There’s a much more detailed but completely unsourced and unattributed history of the Tenedos’ military career here: http://www.kenthistoryforum.co.uk/index.php?topic=15588.0 – scroll down past the first few entries. Tim: Yeah. We have a tradition of having themes for Chebacco. In 2018 [it’s] the material culture, and  is history of religion. We have two guest editors who are professional scholars of religion who summer in Southwest Harbor; they’ve lined up [an] array of authors. Our job in 2019, [is] going to be pretty easy. But I’ve got nothing for 2020, though it would make sense to focus on Maine’s bicentennial. And a story like this would be really fun to pursue. Jenn: Yeah. Particularly if the documents have been digitized so you don’t actually have to go to London anymore. Jenn: You “have” to go to London, yes. Tim: “Have” to go to London. Stay in a hostel, yeah. Jenn: Do they have grants for things like that? Jenn: That would be pretty cool. Tim: I think it would be awfully fun. Tim: And also this story of island resistance. I’d like to know more. I really need to read up on the War of 1812, because I think that the islanders were in a tough place. Are they going to support those boys selling raspberries to [the British]? To what extent was their collaboration or cooperation with the British? What was the national picture like for the War of 1812? Jenn: It sounds like … It’s like a local story that is just the tip of the iceberg of a much bigger story. Tim: Yes, which often they turn out to be. [That’s] the reason that we try to work so closely with University of Maine and College of the Atlantic because we try to bridge this world of local history. … What the world of professional historians encourages us to do is to acknowledge the context and connections – to contextualize these stories. That’s something that we are constantly trying to do. I have a lot of work to do to try to understand that story a little better. Jenn: … banding together, … us against them. Tim: … the old deaf man. Jenn: I love that, yeah. Jenn: Stubborn comes up in that quite a few times. Tim: Just like the Norwood’s Cove object and how it reflects what present-day historians or writers were writing [about] history, it strongly reflects the viewpoints of their present day. So this is 1905 … How did Americans … How did the sophisticated academic cleric – retired, high-church cleric – George Street, how did he wish to view the islanders? Tim: It kind of reflects … the ideal archetype of an islander … that was depicted in Charles W. Eliot’s John Gilley of Baker Island. Jenn: Yeah. They’re stubborn. The old people don’t take no for an answer. They stand up for themselves. They band together, islanders as a community. Tim: I think this might be my project, Jennifer. I’ve been floating around looking for what’s next. Maybe this is it. Jenn: That’s awesome. I look forward to hearing what you find out. Tim: Yeah. I think I’ll start digging. Eliot, Charles W. John Gilley, Maine Farmer and Fisherman. American Unitarian Association, Boston, 1904 [Also published as John Gilley of Baker’s Island, Applewood Books, 2005. Parkman, Francis. France and England in North America. 7 volumes published between 1865–1892.